The Sawyer 48-inch ceiling fan features a sleek brushed nickel finish with a clear glass light shade. This 48-inch dual mount fan comes with 5 reversible blades in oak/cherry and a remote control for your convenience. The contemporary look complements many decors and will add function and style to your home. Casablanca motors move more cu. ft. of air per minute (3989 CFM for the Concentra Gallery) while using significantly less energy. 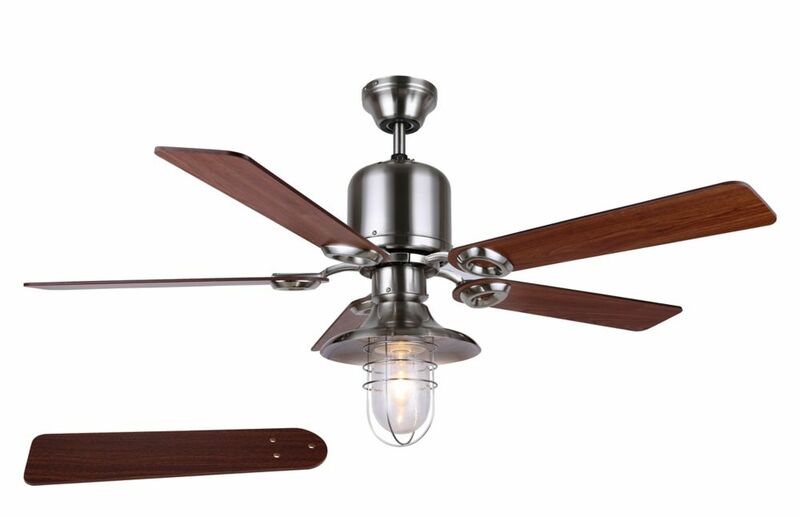 Enjoy outstanding air movement and noted Casablanca durability in a simple, high-functioning fan with a 54-inch blade span designed for large rooms. Clean details meet impeccable styling in a brushed nickel finish to give you a fan equally at home with antiques or in a Soho loft. Complete with a chic cased white glass bowl light, Concentra Gallery is a where transitional meets traditional. Match your fan to furniture, wall colour or moulding details with reversible Walnut/Burnt Walnut blades. Blades are set at the optimum pitch to deliver maximum airflow at any speed. The Hampton Bay Hawkins 44 in. Ceiling Fan features a twist-and-lock installation method that offers ease in installation and helps conceal hardware for a sleek, integrated look. The fan's brushed-nickel finish, 5 reversible white/honey blades and frosted-glass light kit provide a transitional style that complements a wide variety of decor styles, and the 3-speed reversible control enables you to select the desired speed and direction of airflow. The 52 In. Springview ceiling fan in brushed nickel finish uses an integrated light with frosted glass. Perfect for large rooms with vaulted or sloped ceilings. Includes 5 reversible blades in medium maple and dark walnut finish. Includes 190W limiter for energy savings. Also includes safety cable. Lifetime motor warranty. Sawyer 48-inch Brushed Nickel Ceiling Fan with 5-Reversible Blades and Clear Glass The Sawyer 48-inch ceiling fan features a sleek brushed nickel finish with a clear glass light shade. This 48-inch dual mount fan comes with 5 reversible blades in oak/cherry and a remote control for your convenience. The contemporary look complements many decors and will add function and style to your home. Sawyer 48-inch Brushed Nickel Ceiling Fan with 5-Reversible Blades and Clear Glass is rated 5.0 out of 5 by 4. Rated 5 out of 5 by Mila from It is very stylish and beautiful. The detailed said the product is 48" high but I did't believe i... It is very stylish and beautiful. The detailed said the product is 48" high but I did't believe in it and ordered it anyway. I was right it is 24" from the ceiling and very safe to have in a room with a low ceiling. I have it in my dining room just above the dining table. Love it! Rated 5 out of 5 by Momhomemaker from Very nice quality and helpful customer service when called. The... Very nice quality and helpful customer service when called. The instructions however, are a little confusing because it is for multiple styles of fans. Overall, happy! Rated 5 out of 5 by Chuck from Ceiling Fan Looks good, installed easily, decent price. We are very pleased. Rated 5 out of 5 by Newhomeownerx2 from Great Ceiling Fan Not difficult to install and a perfect size for a smaller bedroom. A very stylish and industrial nautical look all in one! Concerned about the distance from the ceiling this fan is. Planning to use over a bed in a bedroom with 8' walls. Description says &quot;assembled height 40 inches&quot; and also says &quot;item height 12.6 inches&quot; and a reviewer says &quot;it's 24 inches from the ceiling&quot;.